Ground Penetrating Radar Systems, LLC was founded in 2001 with one GPR scanning unit operating out of the basement of a concrete cutting and coring company in Toledo, Ohio. The beginning of GPRS is mostly a story of trial by error and learning on the job site as there was no standard training school or certification to learn how to use the devices. The technology at the time was brand new to the private industry and the early years were mostly gauging the feasibility of Ground Penetrating Radar as a basis for business. Spending many days learning from his mistakes and teaching himself how to utilize the equipment, it took Matt Aston (acting President and Founder of GPRS) a few years to be convinced that GPR was a viable service to serve the construction industry. 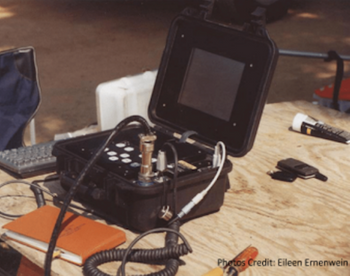 The first GPR unit purchased by Aston and his new company was the GSSI (Geophysical Survey Systems, Inc) SIR (Subsurface Interface Radar) 2000, seen below. Flash forward to 2019. GPRS’ focus has still been to continue finding and utilizing the industries newest and most advanced equipment to locate subsurface concerns. Each technician now wields multiple GPR antennas, EM Wand and Transmitters, GPS collection units, duct hunting and line tracing tools. Additionally, each tech has access to magnetometers, a slew of additional GPR frequencies, Electromagnetic Induction units, sewer cameras, sondes, CCTV crawlers and several other technologies. While adding more tools to the arsenal of each locator, GPRS has also pushed the industry in utility locating theory. Assisting in the development of a methodology has been a more recent venture of the training team. The SIM model, which is an acronym for Subsurface Investigation Methodology, is an outline of the process a technician should subscribe to in order to complete the most thorough subsurface investigation possible. While private utility locating and concrete scanning procedures are not perfect, following a process that involves multiple technologies and steps allows the field personnel to be consistently accurate and efficient on all jobs. In the image to the right, a GPRS Project Manager is seen with his SIR 3000, 400 MHz antenna and RD 8100 Locating Wand, standard locating equipment for all GPRS technicians. This is the minimum amount of equipment that would be used on job sites completed by the GPRS team. The newest wave of technology that has been completed involves CAD, 3D modeling and Drone Mapping. The benefit of having a precise scan of an entire locate or concrete scan is an incredible asset for construction professionals to have in their arsenal. The technologies that will be discussed in the coming pages outline some areas where GPRS is pushing the output of what can be completed on the average job site. Even more effective is that these outputs are becoming more accurate, user friendly and best-of-all more affordable. The cost for each of these projects discussed will be under $1,000; which on a multimillion-dollar project is a small percentage of cost as compared to the potential losses and delays incurred due to a line strike. The most common output that GPRS Project Managers are completing involve GPS and CAD mapping services. This has been in the arsenal at GPRS for 5-6 years, however the accuracy and speed of turn around have greatly increased while the cost of the services has seen a strong decrease. Due to the efficiency of the field staff and CAD processing system, GPRS can complete a locate and return an as-built style CAD file in 5 business days from the day of the project completion. The aerial below is the CAD map created recently on a project where GPRS located a large portion of the facility. The project manager on site was able to collect all the data with a Geode, upload the data and create a .kmz, and layer a CAD file provided by the client into the data he collected. This allows the project team to operate within the file and remove the utility layer when necessary. The cost of GPS and CAD mapping generally starts in the $300-$400 range and varies on project size and scope. The most recent technology that GPRS has deployed is the use of Drones to capture real-time exact markings. The project area is scanned with a drone to collect photos, those photos are then meshed into one large file. This Orthomosaic map, as it is referred to, is then provided in an interactive photo file, as in the case below, but can also be provided in 3D output. The aerial below is the drone data from the overall view. This view is approximately from a height of 65 foot (from ground surface) but taken at a high resolution. 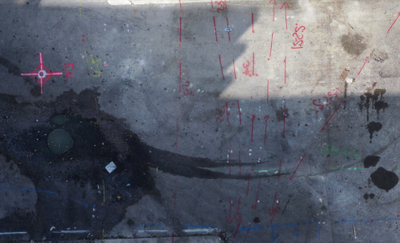 The call-out boxes are areas where zooming in allows the user to see even the smallest paint marks and depths that were marked on site by the locate technician prior to the drone scan. The interactive nature of the file allows the client to move around throughout the scan area without having to be on site and see precise site conditions and markings at the time of the scan. While memories may fade, the drone provides factual information about the site at the time of the scan, protecting both the GC and subs from potential future damages, long after the paint is gone from the site. The project cost for a scan like this starts around $600 and varies depending on size and scope of project area. 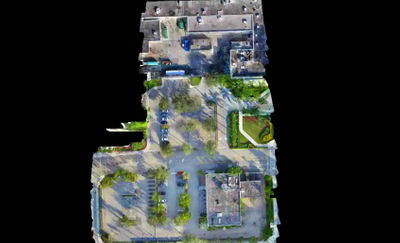 In addition to the initial 2D output, the drone can also provide 3-dimensional data for the client to utilize. This tool can be scaled and used to measure items and distances and get a more in-depth view of the site conditions. The video below is a demo of the same project observed above in the aerial photos from the drone. The 3D output requires some additional software to view the files, however for the right project can be extremely helpful when designing site usage or planning when access to the site is cumbersome, restricted or too time consuming. The starting fee for a 3D map like this is around $800 and can vary depending on project size and scope. 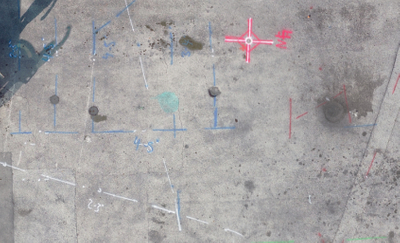 Additionally, GPRS has utilized a 3D scanning system to mark accurate concrete findings for a design project. The client was planning to cut out a large area in a Post-Tension deck. In order to understand which cables had to be cut and anchored, GPRS marked out all the PT cables in the area. Following the scans, using a Mini Xt, Sir 4000 and 1600 MHz antenna, a 3D camera was used to document the area and provide a point-cloud model for the design team to operate within. The client was able to design where the staircase could be placed in the slab and the number of cables that needed to be cut and anchored. Fees for this service generally start around $400 and can vary depending on project size, scope and location. As GPRS continues to lead the industry in subsurface scanning solutions, new technologies and methods will always be analyzed and included when necessary to push the standards for the trade. 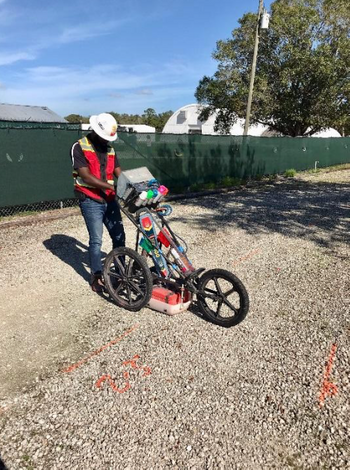 Until the science of GPR becomes exact, the use of multiple technologies, methods and standards will be necessary to improve the output and consistency of the services. GPRS currently is operating in 53 markets in the united states and out of those 53 markets cover the entire country coast to coast (including Hawaii and Alaska) with Locating and Concrete scanning services. While drones and 3D scanners are only part of the arsenal currently used by GPRS with its scanning solutions, look for future technologies to be included as they are developed such as Virtual Reality and Augmented Reality. For more information on what we can do on your job site or if you have questions about how we can apply technologies to your project, contact a GPRS Project Manager today.